A challenging core workout can be performed either at home or at the gym. My other pages of core exercises have consisted of specific examples that mostly can be performed at home with no or very little equipment. But what about the vast resources that a gym provides? That is where this page comes in. Here, every exercise will require some sort of supplemental equipment, whether its a bar, cable column, or weights. 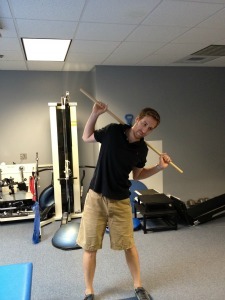 The key to an effective golf resistance training program is RESISTANCE! If you are in excellent shape and are familiar with working out, feel free to dive right in with any core workout listed here. You likely won't encounter any problems. If you are new to core exercises, it may not be a bad idea to investigate some of the less complex core strengthening exercises listed on my other pages and then come back here when you are ready for a new challenge. -Grab a large bar (like you would use with a bench press), and rest it behind your head, resting on your shoulders. Hands should be gripping the bar wide, and feet should be shoulder about width apart. -Posture is important so keep your back straight and head up. -Gently side bend at your waist to the right side as far as you feel comfortable, return to upright, and then gently side bend to the left side. *Modification: Hold dumbbells in each hand instead of using a bar. -Kneel (with rear end on resting on your feet), facing a cable column machine with a rope attachment positioned overhead. -Grab the rope with both hands and pull down so that your hands are on either side of your face. The axis of motion will come from your low back/abs, while your hips should remain stationary. -Contract your abs and bend forward, bringing your elbows to your thighs (don't forget to exhale!). -An increased challenge for a traditional core workout. Position yourself in a decline bench, and lay back with your hands behind your head to protect your neck. Perform a crunch! 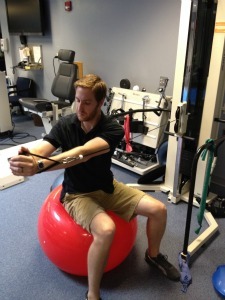 -Don't forget about an essential part of the golf swing, ROTATION! Sit on a bench with a bar resting across your shoulders. -You may need help with the bar if you begin adding extra weights. Maintain good posture and slowly rotate your trunk to one side, and then back to the other. 5. Cable Rotations With Stability Ball : This will take the Cable Rotation exercise listed on the Core Strengthening Exercises page to the next level. -Attach a handle and position the cable in a middle position of the column. -Lie on your back on the stability ball, with your body perpendicular to the column. -Grab the handle with both hands, with elbows locked, and hold it directly in front of you. Slowly rotate to the opposite side of the column, and then return to the starting position. 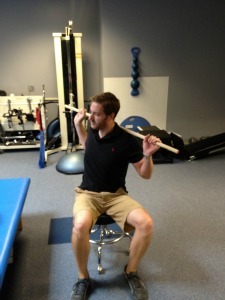 -Perform a set number of reps and then re-orient yourself to perform to the other side. You will not need a lot of weight to get a good core workout! *This is similar to the picture above, except that you are lying down. -Sit at the end of an exercise bench, with your hands at your side, and back straight. -Lean back, and elevate your legs (keeping your knees straight), so that your body forms a "V". -Lower your legs and repeat. -Sit at the end of an exercise bench, with your arms crossed at your chest and back straight. -Lean back and elevate your legs with your knees slightly bent. -Perform bicycle kicks with your legs for as long as you can before tiring out.